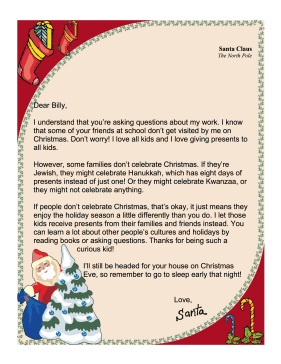 Santa encourages kids to ask about other holiday cultures with this Christmas letter for kids curious about different religious celebrations. I understand that you're asking questions about my work. I know that some of your friends at school don't get visited by me on Christmas. Don't worry! I love all kids and I love giving presents to all kids. However, some families don't celebrate Christmas. If they're Jewish, they might celebrate Hanukkah, which has eight days of presents instead of just one! Or they might celebrate Kwanzaa, or they might not celebrate anything. If people don't celebrate Christmas, that's okay, it just means they enjoy the holiday season a little differently than you do. I let those kids receive presents from their families and friends instead. You can learn a lot about other people's cultures and holidays by reading books or asking questions. Thanks for being such a curious kid! I'll still be headed for your house on Christmas Eve, so remember to go to sleep early that night!